1 bedroom apartment built in 2008 set in the traditional Cypriot village of Kissonerga, Paphos. The apartment is situated on the 1st floor and has a dedicated covered parking space. There is a lift and a rooftop swimming pool with BBQ and seating area along with stunning panoramic sea views to one side and scenery of mountains and countryside to the other. The village itself is situated just off the main Tomb of the Kings coastal road which is a 10 mins stroll away, here you will find a supermarket a couple of bars and some restaurants along side a number of hotels. You will also find the bus stop here which will take you to Coral Bay and its blue flag beaches one way and to Paphos Harbour the other, along the road you will find numerous bars, restaurants, supermarkets and any other service you may need such as banks. In the village itself there are supermarkets, a bank, an English hairdresser, a pub called Julies Bar with sports and internet 40m away, restaurants including a traditional family owned tavern 'Kambana', bakery, a church, sports pitch and a pharmacy. There is a 32 inch LED TV in the apartment with a built in media player so feel free to bring your own USB stick with your films etc on to watch whilst you re there. Notes on accommodation: Everything included in the price of the apartment, air-conditioning, towels, bedlinen etc. Car hire is recommended to explore the vast array of sights and activities that Paphos and beyond has to offer. Smoking is not permitted inside the apartment. Welcome packs provided on request from £10 covering all the essentials you need, if you have a night flight I highly recommend this as you may not find any shops open. Prices are charged by nights so 1 weeks is 7 nights and the apartment will need to be vacated on the morning of the day of departure to be cleaned in preparation for the next guests. Outside: Full width balcony with doors off to the bedroom and kitchen with glass table and 2 rattan chairs, partial sea view with sun on balcony from afternoon to sunset. 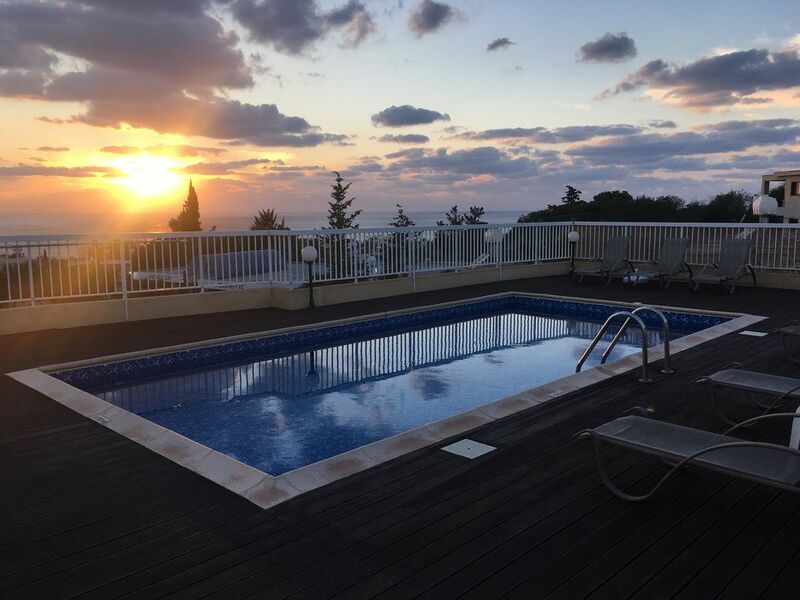 Stunning pool area on the roof with spectacular panoramic sea views, raised decked area, sunbeds, ample sized swimming pool with steps and a pool shower. A few steps off the decking is the covered BBQ area with sink and seating. Toilets and changing rooms are also on the roof in the pool area. Due to the location of the pool on the roof it is a superb sun trap from sunrise to sunset. Utility Room: Iron, ironing board, clothes dryer in cupboard. Cleaning / Towels / Linen / Maid service: Bedlinen and towels are provided (not beach towels). Cleaning prior to arrival and upon vacating the property. Fresh linen and towels are provided per week eg for a 2 week stay 2 sets of bed linen & 2 sets of towels per person are provided. Other: Air-conditioning unit in lounge (18,000 BTU) with cooling and heating modes and remote control. Smoke alarm. Cots can be hired separately for a small charge. Owner was very helpful and quick with additional information. He also emailed a local area map along with a more detailed road map. Very reasonably priced apartment, clean, well located in Kisonerga just off the main road, with a couple of mini markets and places to eat less than 5 mins walk away. Ate at the Village Inn a few times - friendly owners and good food. They've not long been open so the menu is a work in progress but was satisfactory for our needs. Everything in the apartment that you could need. Under-building parking useful for keeping the car relatively cool. Rooftop pool lovely with a constant, cooling breeze and with far-reaching views of the hills behind and the coast in the opposite direction. Would definitely recommend to family and friends. We stayed at this apartment for 2 weeks and thoroughly enjoyed our stay. The apartment is fabulous, good location, nice residential area,yet close to bus routes. Upon arrival the apartment was exceptionally clean and very well presented. The apartment is very spacious and has an ideal kitchen for those wanting to do self catering.Beautiful beach in walking distance (Vardas) much nicer than the crowded beaches. Sun/ Pool terrace on the roof is fantastic and so clean too. There is also a lovely sea view from the pool. Would definitely recommend this apartment for a relaxing stay. Thanks Stuart. The local sandy beach is just over a 10 minute walk away through banana plantations. Coral Bay with its 2 blue flag beaches is a short drive or bus ride away along the coastal road and has numerous shops, bars and restaurants. Paphos airport is about a 20 minute drive away from the apartment and Larnaca is approx a 1h 30m drive away. A 5 minute walk from the apartment is the main coastal road and the nearest bus stop with a service that operates to Coral Bay and also to Paphos harbour area. Car hire is recommended as there is so much to do and explore in Paphos and the surrounding areas. Kato Paphos and its stunning harbour with castle, pavement cafes, restaurants, shopping centres and nightlife is reached in less than 15 mins by car or by bus. The ancient Tombs of the Kings and mosaics are a ten minute drive away. The gorgeous fishing harbour of Latchi with its water front seafood restaurants is a 45 mins drive which is also the siting of Aphrodites Bath. Coral Bay is a 5 min drive away. Other attractions are an animal park, sea caves, National Park, Adonis waterfalls. Our property is managed by a British family who live near the apartment and they will meet you on arrival at the apartment to welcome you and show you the basics of the complex and give you some local information. they are on hand should you require their assistance during your stay. Booking Notes: On booking a 25% deposit of full rental value will be required (non refundable) payable on confirmation of booking. The balance is payable 6 weeks prior to arrival, plus refundable security deposit of £50 to cover against Damage/breakages. If booking is 4 weeks away or less full payment will be required at the time of booking. Changeover Day: Flexible any questions please ask. Notes on prices: Prices are for the property per week in UK Pounds. Special offer 25% discount if booking 2 weeks. Long winter lets available please enquire for further details. All prices in pounds sterling per week and include electricity, air-conditioning, linen, towels and end of let clean.